The Bodhisattva is an inspiring concept. It means 'enlightenment being', as opposed to the Buddha who is the enlightened being. The entirety of the Bodhisattva's life-force and inclination is devoted to the attainment process. Enlightenment is not a static state; it is a dynamic process of mind-growth such that is beyond the space-time continuum and inconceivable by rationality. The Bodhisattva is on the verge of this process, having put together the perfectly harmonious mandala of their own minds only to realise that it remains insufficient. So they set out on the path that requires great selflessness and courage, and commit themselves to achieving enlightenment for every jeev (living beings), not simply for themselves. This work, as seen from the Mahayana point of view, takes aeons. 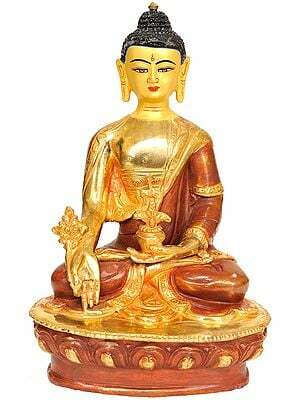 The Bodhisattva takes endless rebirths to help usher fellow jeevs on towards enlightenment. A number of such Bodhisattvas are revered to this day in the Nepalese Buddhist tradition; they find their place in lore and art, and inspire as much devotion in people as does the Buddha Himself. Icons of some of the more popular Bodhisattvas have been handpicked from Nepalese sculptors, and put into this one-of-a-kind collection. The dominant medium is copper (gilded), and each of the pieces in this subsection of Nepalese artworks is replete with the aesthetics that one would expect of such spiritual paragons.